An area historically favoured by the Royal Family, and a firm favourite of the Queen, Royal Deeside has lots to offer including peace, tranquility and nature at its finest. Enjoy reading through our information and guide on things to see and do whilst taking a country cottage holiday in Deeside. 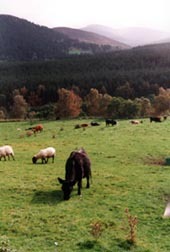 Deeside is one of the best known and popular visitor destinations to Scotland. It's a remarkably pretty area with the river Dee and its tributaries (which spring out of the Cairngorm mountains), forests, mountains, lochs and the royal connection with Queen Victoria and Balmoral. The river Dee spills out into the North Sea from Aberdeen Harbour and this is where we begin our travels. The River Dee flows through some of the loveliest countryside in Scotland, from its source in the Cairngorms to the city of Aberdeen on the north east coast. 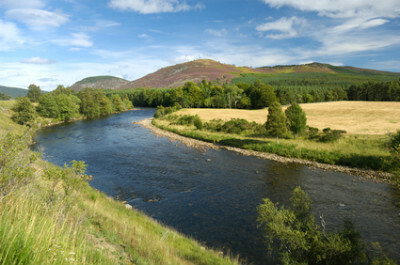 The mountains, wooded valleys and countryside surrounding the river are known as Royal Deeside. Royal Deeside is within the Cairngorms National Park and the scenery here includes forests, mountains, valleys and fields. Add to this pretty villages such as Dinnet, Crathie and various others along with Balmoral Castle and it is easy to see why people choose to visit Royal Deeside. The River Dee meanders through the south of Aberdeen, past Duthie Park with its winter gardens. During the summer it is common to see canoeists paddling away on the river. There are also walks along the side of the river, which in the spring are blessed by myriads of daffodils. Leaving Aberdeen behind, via the 16th Century Bridge of Dee, and following the A93 part the wealthy villages of Cults and Milltimber, to Banchory, Ballater and Braemar, the scenery soon becomes hillier and very pretty. The Castle Trail is associated with the Dee, Drum Castle (8 miles west of Aberdeen), and Crathes Castle with its magnificent gardens with forest walks, are both encountered before reaching Banchory. Opposite the entrance to the Crathes Castle Estate is an arts and craft centre, with an up-market restaurant and venison on the menu, that's worth a visit. Banchory, with its museum of the history of the area, is a traditional town with some attractive pink granite buildings bordered by modern estates. There is a lovely river walk from Banchory to Crathes Castle plus several other good walks in the area. The Forestry Commission organise regular forest walks, e.g. 'Is it a toadstool?'. Phone them on 01330 844 537 for details. If you take a short detour via the A980 out of Banchory, you will come across the splendid Craigievar Castle. The next major town, Aboyne, is best known for its Highland Gathering held every summer. Like most large Scottish towns it boasts an 18 hole golf course. See holiday lets near Aboyne. Ballater, still strongly associated with the Royal Family, is a handsome granite spa town. It was here that Queen Victoria would arrive by train for her stay at Balmoral Castle eight miles away. With the decline of the railway, the original Ballater Station was rebuilt to incorporate a 'Royal Waiting Room', but later converted to now house a very nice cafe (which provides newspapers to read), sweet shop, and tourist office which incorporates a Queen Victoria Exhibition showing the platform, and royal waiting room, complete with an audio presentation. It's free and well worth a visit. A Victoria week is still held in early August every year which culminates in the Highland Games on the first Saturday of September, at Braemar, which representatives from the Royal Family traditionally attend. The countryside surrounding Ballater is beautiful with many birch and Scots pine trees. Lochnagar ( Prince Charles wrote a story about 'The Old Man of Lochnagar') is a to-climb hill on many a hill walkers list. At its foot is Loch Muich with an 8 mile walk around it. This is excellent walking, fishing and hunting country. The Royal family still retreat to Balmoral for a holiday each year. Between May and July the estate is open to the general public. Less than half a mile from Balmoral is Crathie Church where Queen Victoria's famous personal servant John Brown is buried. The Royal family attend services here when they holiday at Balmoral. It is the royal connection that gave rise to the name Royal Deeside. Travelling onwards to Braemar, glimpses of the Dee can be spied through the trees. The landscape is more wooded and increasingly hilly. This is very much deer habitat. If you look carefully, especially approaching dusk you may come across herds of deer on the heather clad hills. Braemar, at 1,100 feet above sea level, has a 'touristy' highland feel to it. Braemar Castle with its fairytale turrets (open daily, except Fridays, Easter to September, 10 am - 6 pm, free car park, small admission fee) offers a good historical introduction to the area. The Highland Heritage Centre which houses the tourist office and souvenir shops provides an audio visual exhibition about the attractions of the area, including its royal connections. A beautiful, wild expanse of countryside welcomes walkers and nature lovers. About six miles west of Braemar, the Linn of Dee is a popular spot where the Dee is forced through a narrow rocky gully to produce fierce and turbulent currents. There is a plaque here as a memorial to the deaths of two youngsters from drowning and a warning to others. Further along the path, the Dee is shallow and ideal for paddling. Another beautiful location is the Linn of Quoich on the nearby Mar Lodge Estate. Royal Deeside Woodland log cabins are located in beautiful Royal Deeside near the Cairngorm National Park and all its attractions. Situated in the small rural village of Dinnet, next to a nature reserve, these Lodges are well placed to visit Royal Deeside and Balmoral Castle. Activities on offer in Royal Deeside include fishing, hiking, walking, gliding, quad biking, archery, go-carting, shooting and skiing. Skiing is possible in season at Glenshee and the Lecht which is around 45 minutes away by car. Other places to visit whilst on a holiday in this part of Scotland include the whisky trail (there are a large number of distilleries to be found in Aberdeenshire), the castle trail (a large number are dotted throughout the Aberdeenshire countryside, the Cairngorms National Park and Balmoral Castle which is just 10 miles away. 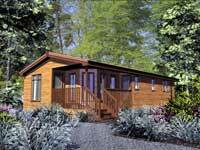 Click on the photo to find out more about these self-catering log cabins in Aberdeenshire. Click here for a list of Scottish self-catering holiday cottages and apartments.